If I set my sample rate on my externally clocked 8 channel preamp to 192kHz and I set the Studio 192 to 48kHz, they some how actually sync, why is this? It's sync'ed so shouldn't it work? No not quite. Setting sample rates must be done manually on each device and they must match. Also keep in mind what your gear actually supports. The Studio 192 supports ADAT over 44.1kHz, 48kHz (@ 8 channels) and 88.2kHz and 96kHz (@4 Channels) using SMUX. If you externally clocked converter or interface you're connecting to supports a higher sample rate that is an equal divisible of the sample rate the Studio 192 is on, it may actually lock, however that doesn't mean audio will pass, and if it does, it will sound strange or distorted. For example 48 divides into 192, 4 times. Be sure to set the Studio 192 and your external converter to be the same supported sample rate for each device so they match. How to determine the sample rate Studio 192 switched to while externally clocked? 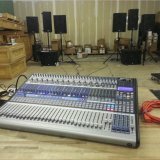 How to sync TWO D8 units to the Studio 192? Better to connect a DigiMax LT to Studio 192 using Word Clock, the DigiMax internal clock, or the embedded clock? Sample rate of studio 192 locked in 192k and 176k. Will the Fat Channel XT replace the Fat Channel DSP on the Studio 192?